Roy of the Rovers: Kick-Off out now! 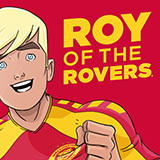 It's actually happening: Roy of the Rovers has returned to comics! Roy Race and Melchester Rovers are finally back in comics with the release of Rob Williams and Ben Willsher's superb graphic novel Roy of the Rovers: Kick-Off. Yes, it's real! The greatest fictional footballer of all time is back, with a new look and a new story. Exciting isn't the word! Sixteen year old Roy Race always dreamt of playing up front for Rovers. Oozing with natural talent and possessing a powerful left foot, Roy may just be the answer to all of Melchester’s prayers. Roy of the Rovers: Kick-Off is out now!